Belvedere Designs: July 2016 Customer Photo Winner! July 2016 Customer Photo Winner! This is one of our most popular designs and we just had to show you Annie's installation! This is Wall Quotes™ decal - Bathroom Rules Elegant. Does your bathroom have more vertical space? No worries! 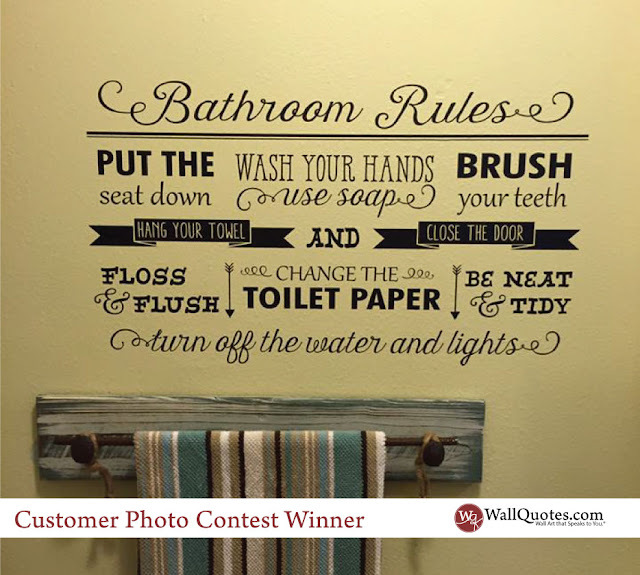 We also have our original Bathroom Rules decal. Annie ordered the 17" x 30" size in Black and it looks great above her towel rack. Nice job!